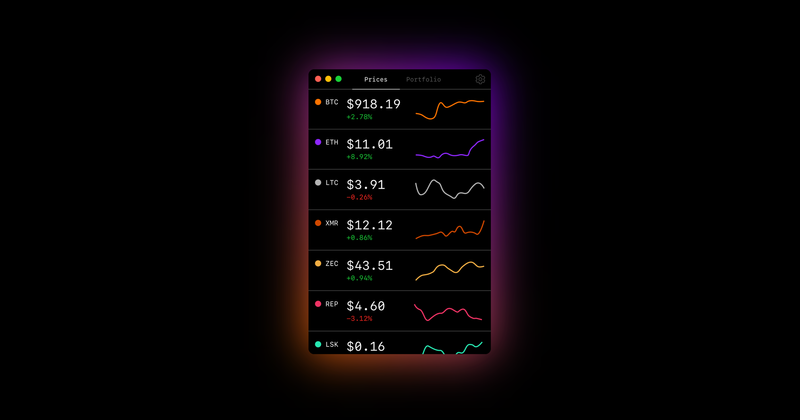 Lionshare is a simple macOS application that helps you track cryptocurrencies and your portfolio. Build using Electron, React and Mobx. For the API and other parts of the Lionshare herd, checkout our Github page or get in touch with us on Twitter. Special thanks to Coinbase for sponsoring the release of Lionshare as open source software. If you’re interested in building products to reinvent the future of finance, get in touch. Electron specific code, including application configuration and Webpack build files, can be found under desktop/. All React application code is stored inside src/. To install for development, clone the repository and install the dependencies with yarn. Lionshare is an open source project created by Ben Jennings, Jori Lallo and Maksim Stepanenko. When will Lionshare support < your favorite coin >? Does my portfolio leave my computer? No, Lionshare is completely client-side and doesn&apos;t hold any keys. We take security very seriously and all our communication happens over HTTPS. All code is open source. We won&apos;t, this is a side project. When can I have a Linux, Windows, iOS, etc version? Right now we&apos;re focused on supporting macOS but open to adding support for other platforms in the future.